Born in 1882, deceased in 1967. Please help improve it by adding dated informations, images and videos about Edward Hopper. Hopper was a good student in grade school and showed talent in drawing at age five. In 1895, he created his first signed oil painting, Rowboat in Rocky Cove. Hopper began art studies with a correspondence course in 1899. In 1905, Hopper landed a part-time job with an advertising agency, where he did cover designs for trade magazines. 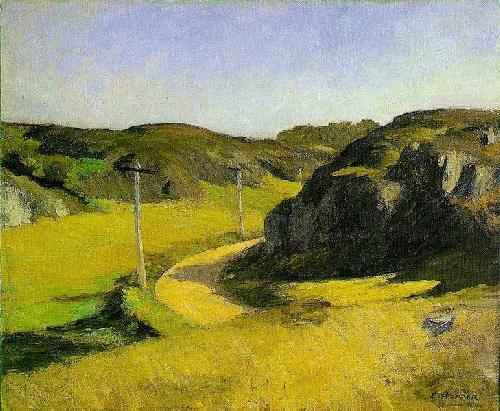 In 1912, Hopper traveled to Gloucester, Massachusetts, to seek some inspiration and did his first outdoor paintings in America. At an impasse over his oil paintings, in 1915 Hopper turned to etching, producing about 70 works, many of urban scenes of both Paris and New York. By 1923, Hoppers slow climb finally produced a breakthrough. With Nivisons help, six of Hoppers Gloucester, Massachusetts watercolors were admitted to an exhibit at the Brooklyn Museum in 1923. In 1925, he produced House by the Railroad. In 1929, he produced Chop Suey and Railroad Sunset. In 1933, the Museum of Modern Art gave Hopper his first large-scale retrospective. The Hoppers built their summer house in South Truro in 1934. He wrote in 1939, So much of every art is an expression of the subconscious that it seems to me most of all the important qualities are put there unconsciously, and little of importance by the conscious intellect. Edward Ruscha - Some critics are quick to see the influence of Edward Hopper's Gas in Ruscha's 1963 oil painting, Standard Station, Amarillo, Texas. Hopper died in his studio near Washington Square in New York City on May 15, 1967. In 1993, Madonna was inspired sufficiently by Hopper's 1941 painting Girlie Show that she named her world tour after it and incorporated many of the theatrical elements and mood of the painting into the show. In 2007, an exhibition focused on the period of Hoppers greatest achievementsfrom about 1925 to mid-centuryand was presented at the Museum of Fine Arts, Boston. His artwork was used as the basis for the surface world in "Texhnolyze" as well as for much of the 2008 animated film "Bolt"
In 2011, The Whitney Museum of American Art held an exhibition called "Edward Hopper and His Times"